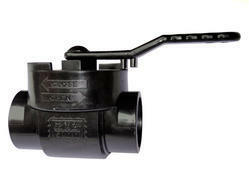 Leading Manufacturer of top entry ball valves from Ahmedabad. Leveraging on our vast expertise, we are providing all types of Top Entry Ball Valve. These products are known for their high strength and offer in various sizes and dimensions as per the clients' needs. Owing to their unmatched quality, these valves are widely used in chemical industry applications. Carbon Black resists ultraviolet rays and prevents degradation of polypropylene from sunlight exposure.